Top quality work, for your entire satifaction! When approaching a small business such as ours, what is particularly nice is the personal contact you can have with us, to discuss step by step all the points concerning your instrument, and develop confidence in your relationship with us. 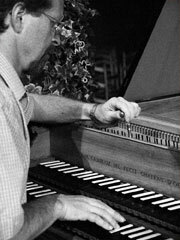 This is important during the entire construction time, but also for the follow-up of your harpsichord in the long run. Together, we will bring your dream to reality! It will involve all kind of woods, rich oil paint colours, unforgetable aromas and finally to spellbounding sounds! Your instrument, infinitely more than just a piece of furniture, will become part of your history and remain in the midst of your family for generations to come!